Welcome back to the new Monthly Update! Send us your thoughts by emailing charlotte.stein@ed.gov. (4) instructions for commenting on the NPRM. A recent report from The Civil Rights Project at UCLA shares findings related to the discipline of students with disabilities at charter schools, further supporting the Department's efforts to address significant disproportionality. Spring has sprung and the Department is revitalized with the official confirmation of John King as US Secretary of Education! Our congratulations go out to John on this important achievement-- OSEP looks forward to his continued leadership. The future is certainly bright, and I am excited to announce the Call for Session Proposals for our upcoming Project Director's Conference, which will take place August 1-3, 2016 here in Washington, DC. Session proposals are due on April 29th. For instruction and proposal guidelines, visit our meetings website, where you can also register for the conference and find more information on this exciting opportunity to learn from and exchange ideas with some fantastic representatives from the field! On March 14, 2016, John King was confirmed by the Senate as the 10th United States Secretary of Education. 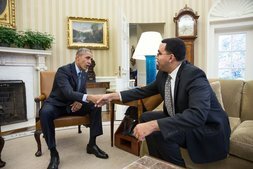 The following day, Secretary King was invited to the Oval Office to discuss the future of US education policy with President Barack Obama. The EDFacts Information Collection package for SY 2016-17, 2017-18, and 2018-19 (1850-0925) has been approved. This package includes all the Part B Section 618 data collections. The package has a new OMB number (OMB 1850-0925; expiration date February 28, 2019). Attachments are posted on the Office of Information and Regulatory Affairs website. Eliminates the collection of File C004/DG 491: Children with disabilities (IDEA) not participating in assessments. Eliminates the collection of previous year’s 619 allocation for each LEA/ESA in the Maintenance of Effort (MOE) Reduction and Coordinated Early Intervening Services (CEIS) data collection. (1) Did the State determine whether the LEA/ESA met the MOE compliance standard in (Reference Year)? (2) Did the LEA/ESA meet the MOE compliance standard in (Reference Year)? (3) By the date of this data submission, did the State return non-Federal funds to the Department based on failure of the LEA/ESA to meet the MOE compliance standard in (Reference Year)? (4) What amount of non-Federal funds did the State return to the Department based on the failure of the LEA/ESA to meet the MOE compliance standard in (Reference Year)? Please note that we will begin to collect the new MOE data elements in the FFY 2016/ SY 2016-17 MOE Reduction and CEIS data submission (due May of 2018). 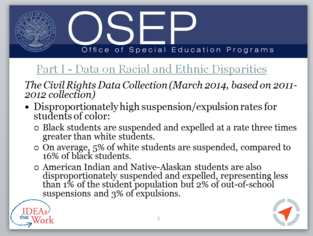 Contact OSEP's data team with questions. This letter addresses OSEP's position on the use of audio or video recording devices at IEP team meetings and whether an LEA is permitted to have different qualification criteria for its personnel than it requires of evaluators who conduct an IEE. The writer asks OSEP for guidance on whether a parent of a child who has been identified as having a disability under Section 504 of the Rehabilitation Act may serve on the State advisory panel as a parent representative of the advisory panel required under IDEA. This letter addresses questions about how the public agency is permitted to proceed if the parent is accompanied to an IEP meeting by an individual/attorney without notifying the public agency of this fact prior to the IEP Team meeting. OSEP policy letters can be found on the Department’s website. 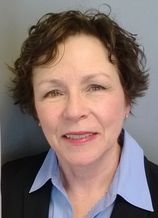 Postsecondary Education Center for Individuals Who Are Deaf or Hard of Hearing (CFDA No. 84.326D). Stepping-up Technology Implementation (CFDA No. 84.327S). The Department continues to work on implementing and adapting to the provisions of the Every Student Succeeds Act (ESSA). Check out the ESSA Transition FAQs (February 26, 2016). The process of Negotiated Rulemaking also kicked off last week, March 21-23, 2016. Materials and information regarding this initial session, as well details explaining Negotiated Rulemaking, and what will take place throughout the process, can be found on the Department's website. Last April, the President announced the Open eBooks project, an app which has officially gone "live" following an announcement from First Lady Michelle Obama last month. 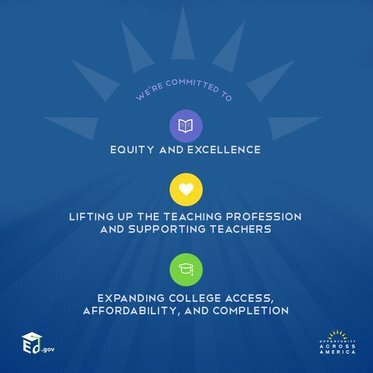 This effort to connect underserved students with over $250 million of free content aligns with the Department's #GoOpen campaign and is part of the White House #ConnectED initiative, both of which promote using technology to improve educational access and outcomes across the US. John King's College Opportunity Across America Tour kicked off on March 16 at Georgia State University. 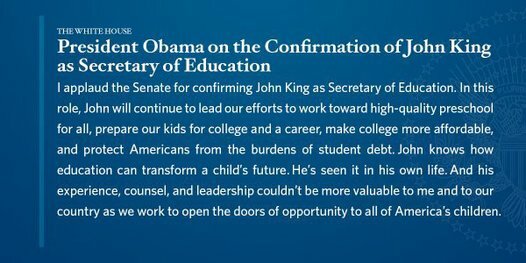 King has resolved in 2016 to promote equity and excellence at every level of education to ensure that every child has the opportunity to succeed; support and lift up the teaching profession; and continue the Department’s focus on returning America to the top of the rankings in college completion by ensuring more students earn an affordable degree with real value. The Department also launched a new Success Mentor initiative, #EveryStudentEveryDay, which addresses chronic absenteeism, as part of My Brother's Keeper efforts. After launching the Career Technical Education Makeover Challenge, Secretary King has called for the reauthorization of the Perkins Act, which provides some $1.1 billion for career and technical education (CTE) programs in seventh- through twelfth-grade and postsecondary institutions. Author and parent Dwayne Ballen was a featured speaker in the Office of Special Education and Rehabilitation Services’ recent Google Hangout on Inclusion in Early Learning Programs. 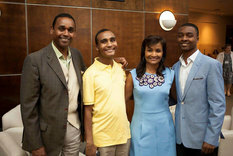 Pictured here are Dwayne, Julian, Martina and Jared Ballen. After last month’s announcement of a new effort to address widespread disparities in the treatment of students of color with disabilities, we asked two educators to react to the news, drawing on their own experiences as special education teachers. Want us in your inbox every month? Signing up a friend?